Bibliophiles and book worms are invited to the second annual Jekyll Island Book Festival. 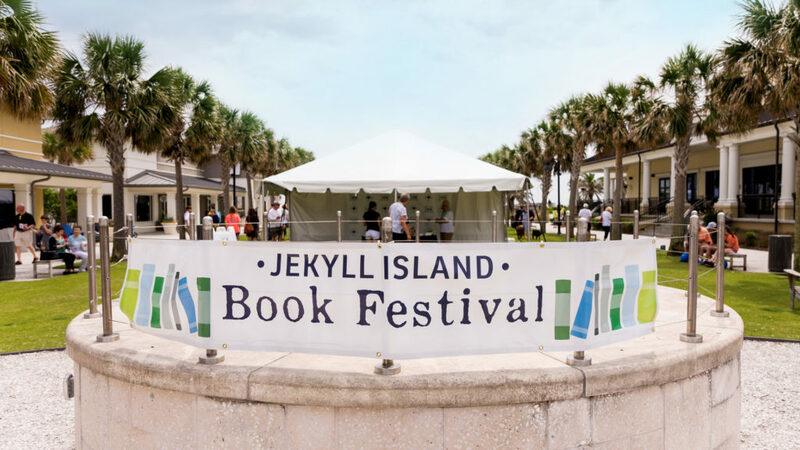 The Second Annual Jekyll Island Book Festival will transform the Beach Village Green into a hub of literary activity on Saturday, April 6 from 10 a.m. to 3 p.m.
From the Turtle Stage, presenting authors will read from their books, share insights from the writing process, and answer questions from the audience. This year’s presenting authors represent numerous genres from cookbooks and memoires to short fiction, novels, and graphic novels. Xhenet Aliu’s novel, “Brass,” was published by Random House in January 2018 and is long-listed for the 2018 Center for Fiction First Book Prize. Her debut fiction collection, “Domesticated Wild Things,” won the Prairie Schooner Book Prize in Fiction. Taylor Brown, who grew up on the Georgia coast, is the author of one short story collection and three novels. His fourth novel, “The Pride of Eden,” will be published in 2020. Best known as a former co-host of ABC’s popular lifestyle series “The Chew,” Carla Hall currently appears on ABC’s “GMA DAY” and is the author of three cookbooks. Her most recent is “Carla Hall’s Soul Food: Everyday and Celebration.” Chef Todd Richards is an award-winning chef known for his contemporary cooking style rooted in soul and Southern cuisine. His book, “SOUL: A Chef’s Culinary Evolution in 150 Recipes,” was published in 2017. Georgia-born, French-trained Chef Virginia Willis is the author of “Secrets of the Southern Table: A Food Lover’s Tour of the Global South” and a 2016 James Beard Foundation Award of Excellence winner. Devereaux Bruch Eyler’s “No Mama, I Didn’t Die: My Life as a Stolen Baby,” is her true story of being stolen and sold to a wealthy family shortly after her birth in 1937, then finding and reconnecting with her biological family at age 71. Steven Nedvidek, Ed Crowell, and Jack Lowe take a true-to-life place — Jekyll Island — and feature it prominently in an alternate history adventure tale. Their award-winning graphic novel series, “The Jekyll Island Chronicles,” imagines action heroes battling anarchists in the early 20th century. In addition to the new Authors’ Alley, an expanded Authors’ Pavilion will host author meet-and-greets and book signings, plus festival merchandise. The Gifts and Books area will showcase authors whose works benefit the Georgia Sea Turtle Center and other sea turtle and marine life initiatives. Additional activities include games, activities for children, costumed characters, and the Marshes of Glynn Libraries’ used book sale and pop-up library.